Warm meets tough, and they make quite a pair. These French Military Surplus Leather Tanker Gloves are excellent all-purpose paw protectors for winter. Great as driving gloves, whether driving a tank or piloting your pickup truck. French Military Surplus Leather Tanker Gloves, New is rated 5.0 out of 5 by 2. Rated 5 out of 5 by Dan09 from Tough yet soft. 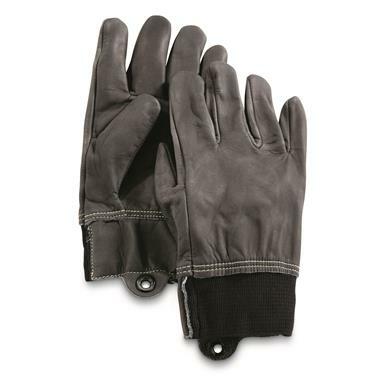 These are a great example of durable utilitarian black leather gloves. The leather itself feels unlined and butter soft, yet thick enough to take a beating, and the long elastic cuffs provide a nice bit of extra support. Not to mention that the plastic grommets on the cuff allow them to be put on a carabiner for easy, accessible carrying. For all those features, you really can't beat the price. Only thing that gives me pause is the fact that my pair has some frayed stitching, but they seem to still be far from falling apart after testing that stitch with a few hard pulls. Rated 5 out of 5 by Graham from Great product at a great price The two pairs I ordered are very soft and comfortable. Great material and very nice form.